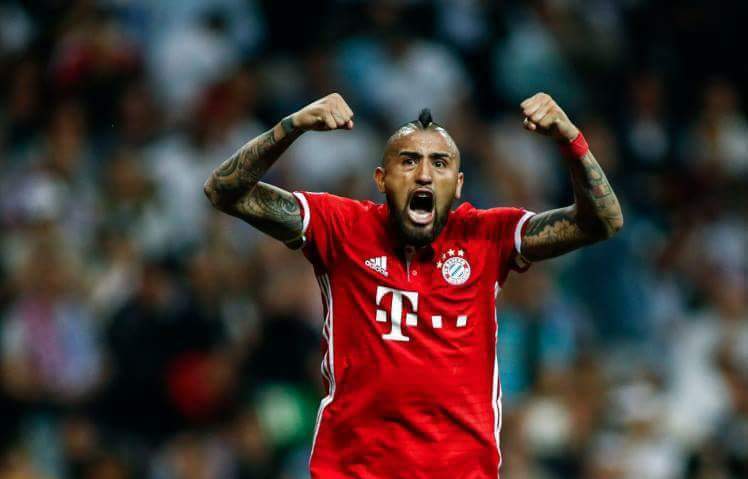 Manchester United have joined the race to sign Bayern Munich’s box-to-box midfielder Arturo Vidal, according to reports. According to German newspaper Bild (vid Team Talk), we have entered the race with Chelsea for the Chilean international as Bayern Munich are ready to sell the 30-year-old over the summer. The runaway German Bundesliga leaders have already signed Vidal’s replacement by agreeing a contract with Leon Goretzka to join on a free transfer from Schalke 04 over the summer. This could spark a battle between Manchester United, Chelsea and any other clubs interested in the energetic Chilean. With Antonio Conte’s future in doubt at Stamford Bridge, it could well give us the upper hand, according to Team Talk. “There is no contact between Chelsea and Bayern. Manchester United are certainly in the market for a central midfielder and have been linked to numerous players in this position over the past week alone. With 36-year-old Michael Carrick expected to leave at the end of the season when his contract runs out, and Marouane Fellaini strongly linked with a move away from Old Trafford too, Jose Mourinho is expected to purchase at least one replacement in this position before the start of next season. Arturo Vidal is in his third season with Bayern Munich since joining from Juventus in a €37 million deal. He won Serie A in all four seasons during his time in Turin and is on course to make it three consecutive with Bayern Munich too. He is an energetic midfielder which could make for a wonderful partnership with Paul Pogba. Vidal also has a powerful, long range shot on him and is excellent at timing his runs into the penalty area. The Chilean does have a nasty streak though and is prone to disciplinary issues. Last Monday we signed his fellow international teammate, Alexis Sanchez, from Arsenal.